The Data Commons is a large-scale effort to establish a community-driven set of standards for interoperability for biological data and computation, a massive effort and a broad mandate that has the potential to enable breakthrough research that is currently impossible because data and computations cannot inter-operate between the data, compute resources, and domain expertise that are provided by universities, hospitals, research institutes, companies, nonprofits, and citizen scientists. An important part of defining a community-driven set of standards is defining a community, and toward that end the collective members of the Data Commons met at monthly face-to-face workshops to iterate tightly on a set of technologies and standards that will allow each institution's different compute platforms or data banks to use other institutions' platforms or data banks. Doing this requirs fostering community and creating the right environment for people to work through the issues. One of the biggest challenges we faced in fostering a community that could develop and implement a set of standards across such a large and diverse group of experts and institutes was coordinating information. Specifically, making sure that decisions were properly communicated to the appropriate parties, that important documents made their way to the entire consortium, and that documents that were created and edited also be findable and sharable. This problem began, back in April, as a very small trash fire. People were getting used to the Github workflow and did not know how to find the appropriate repository for the information they needed to contribute, and consortium members were universally annoyed that Google Drive's search functionality was so terrible. In June we rolled out a trial document-tagging system to the consortium, to deafening silence - no one was impressed or satisfied with the tagging system. The real problem was with search. Toward that end, I implemented a full-fledged search engine for the Data Commons that utilized various third-party APIs (Github, Google Drive, Groups.io, etc.) to index content related to the project, and make it full-text-searchable. The result was centillion, the Data Commons search engine. This search engine provides a portal to search for Data Commons-related Google Drive documents, Github issues, Github pull requests, Github files, Groups.io email threads, and more. Our story picks up with centillion. One of the tools I have made heavy use of in support of web infrastructure for the DCPPC project is Flask, a Python library for running a web server. Flask is a very powerful library, but it starts with a relatively simple premise: Flask lets you create a web appplication that will bind to a particular port, and you can then add "routes" that are endpoints a user can visit, like /hello/world, and link those routes to Python functions. 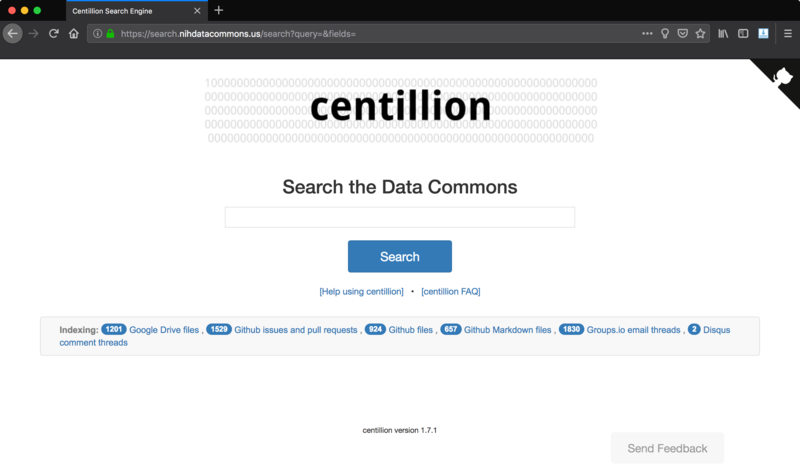 On Monday 2018-10-28 the DIB Lab's weekly lab meeting featured yours truly covering the topic of centillion, the Data Commons search engine. centillion makes use of the Python library whoosh under the hood, to provide search functionality, while the web front-end uses Flask to connect Python functions to a website that users can interact with. Screen shot of the centillion search engine (2018-10-27). As of version 1.7, centillion is packaged as a Python package. The centillion package consists of two submodules, corresponding to the Flask frontend and Whoosh backend, respectively: webapp and search. centillion.webapp implements the Flask app and defines all routes. When the user runs a search, it passes the query string on to a Search object from the search submodule. The webapp submodule does not know anything about the details of the search engine or search index. This submodule is located in src/webapp/ in the centillion repo. centillion.search implements a search engine using Whoosh, a programming library for building search engines. Whoosh does not implement any kind of front end, so its role is restricted entirely to the back end. The search submodule also handles interfacing with the Github, Google, and Groups.io APIs and translating the results of API calls from these services into documents whose contents can be extracted and indexed by Whoosh. This submodule is located in src/search/ in the centillion repo.